Friday October 6th 1899 Will and I went to town early. I was at home for dinner and Will went over to Marys. The folks at home have so much to do. John had the misfortune to fall in the cellar and hurt his knee and is laid up in bed with it. We came home in time to do evening work. 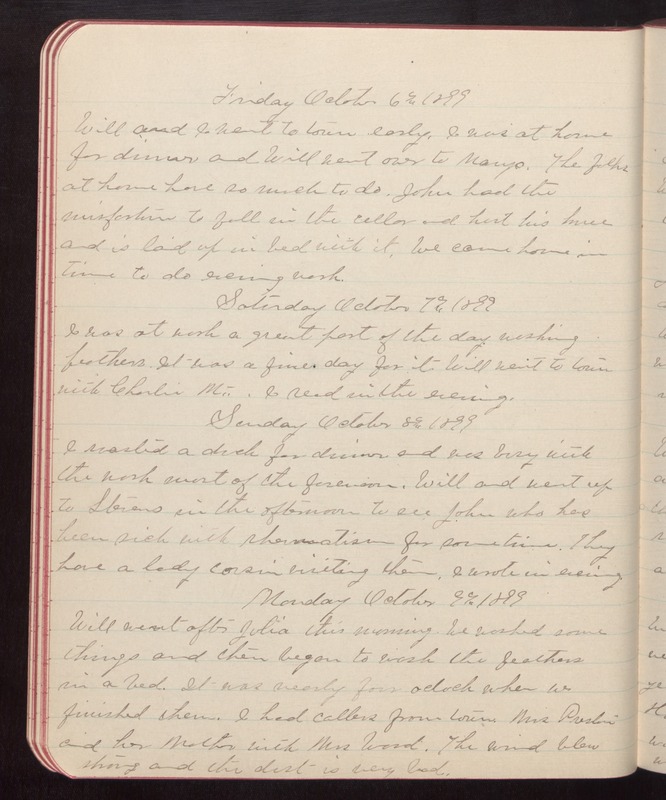 Saturday October 7th 1899 I was at work a great part of the day washing feathers. It was a fine day for it Will went to town with Charlie Mc. I read in the evening. Sunday October 8th 1899 I roasted a duck for dinner and was busy with the work most of the forenoon. Will and went up to Stevens in the afternoon to see John who has been sick with rheumatism for some time. They have a lady cousin visiting them. I wrote in evening. Monday October 9th 1899 Will went after Julia this morning. We washed some things and then began to wash the feathers in a bed. It was nearly four oclock when we finished them. I had callers from town. Mrs Preston and her Mother with Mrs Ward. The wind blew strong and the dust is very bad.